At this time of year, a time of ‘mellow fruitfulness’ , the fruit trees and bushes in East Yorkshire are weighed down heavily with their luscious bounty, just crying out to be picked by avid cooks and made into mouthwatering dishes to tempt friends and family alike. Our Kitchen Garden fruit trees are babies, only a few months old, and probably next year we will be able to pick our own apples, pears, damsons, greengages, Mirabelle plums, Sloes, and bowl upon bowl of raspberries, blackberries and loganberries. Eventually we hope to plan an edible hedge, full of berries and nuts, to feed both us and the birds. But for now, it’s down to the shops, and also picking the wild fruit from the overflowing hedgerows. So I’ve found two recipes which I really like the look of, and they both epitomise the essence of an early English autumn. That morning chill in the air, that extra bright light in the sky, woolly jumpers, the smell of the first coal fires or log burners – could it be the start of ‘comfort food’ time? Yield: It depends on the amount of juice extracted. 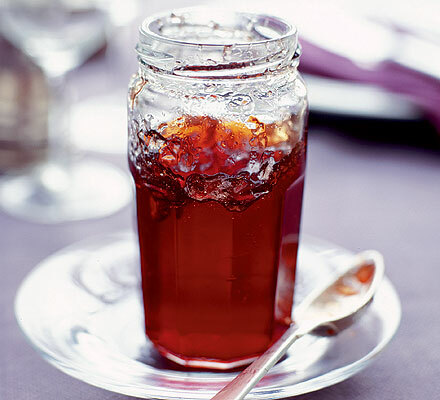 This Damson Jelly recipe is from Mary Cadogan, taken from BBC Good Food. This jelly is absolutely perfect for toast or scones, but also is a perfect match to enhance the flavour of roast meats, such as Venison, Beef and Pork. NOTE: Cooling time also needs to be added to the cooking time. Make sure you have warm sterilised jars ready to store this Damson Jelly. Wash the fruit well, then tip into a large preserving pan with the lemon juice and 300ml (1/2pint) water. Bring slowly to the boil and then simmer for 30 - 40 minutes until the fruit is soft. Carefully pour the contents of the pan into a scalded jelly bag with a large bowl set underneath to catch the juice. Leave for several hours for the juice to drip through. Measure the juice back into the preserving pan, then add 500g of sugar to every 500ml of juice (or 1lb sugar for every pint of juice. Stir over a low heat until the sugar has dissolved, then raise the heat and rapidly boil until setting point is reached. Test this by spooning a little on to a chilled saucer. Cool slightly then push with your finger - if it wrinkles it is ready. If not, return to the heat, boil for 5 minutes more and test again. Pot into warm sterilised jars and cool before sealing. Can be eaten straight away, but keeps for up to a year. This Damson Jelly Recipe is definitely one from “the Seasons of mist and mellow fruitfulness.” Some reviewers suggested to add a pinch of chilli, or if for Christmas, add some cloves, orange zest and cinnamon. What I love about cooking is that you can take a recipe and play about with it to suit yourself, and it’s purpose. Have fun. Next is a great dessert recipe, from the master of desserts, James Martin. This is also taken from BBC Good Food, and received more brilliant reviews than any recipe I have seen before. But, stupid me, that’s what happens when you have time away from blogging – I forgot that I can’t put more than one recipe in a blog post now, so the next recipe is in the next post. Believe me, this next one sounds very, very good. We are going to have it this weekend!